Dexion has been pushing boundaries since the day that founder Demetrius Comino asked himself the question: How can you build storage racks for paper and type that could be knocked down quickly and reused? His answer was Slotted Angle. But Demetrius didn’t stop there. He brought together a group of like-minded people under the Dexion name and he and his team continued with their innovative thinking. They went on to develop the early versions of pallet racking which today forms the backbone of many of the products you see here. The successors in the business went on to expand the possibilities with additional components such as mobile shelving, mezzanine floors and automatic storage machines. Supplying products is only one aspect of the business. Our products are being used in everything from Olympic stadiums to earthquake relief, so innovative thinking is applied to the range of services we offer. Investment in R&D, testing and a forward-thinking culture means that our products and services continually evolve to reflect the changing landscape of logistics. 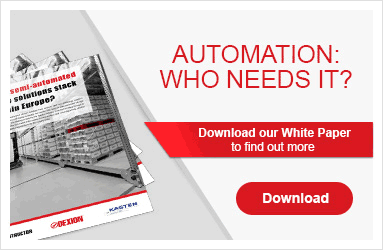 As you can see in our white paper Automation: who needs it? we’re already working on the next innovation.